Without question, the 2017 GSX-R1000R is The Ultimate GSX-R. Suzuki engineers took everything that makes the standard 2017 GSX-R1000 the King of the Sportbikes and ramped it up by adding advanced rider aids such as the IMU-influenced Motion Track Anti-Lock Brake System, clutchless up-and-down quick shifting, and a launch control system that gets the rider out front fast. Other features include a compact competition battery, lightweight upper fork clamp, and LED position lights above the fairing’s large ram-air ducts. Combine all that with the responsive Showa BFF fork and BFRC shock and you have a bike that will stand at the top of the liter bike podium. The new LCD Multi-function Instrument Panel was inspired by the GSX-RR MotoGP dash. This panel is laid out so the rider can easily see the tachometer bar, speedometer digits, and other essential operational information. This effective display is critical as it is the rider’s interface to the GSX-R1000R’s advanced electronics. The panel on the GSX-R1000R is unique as it features a black background. Advanced suspension uses a SHOWA Balance Free Fork and Balance Free Rear Cushion to combine with new Motion Track ABS-equipped BREMBO T-drive 320mm dual front brake rotors and Monobloc 4-piston calipers for extraordinary handling and stopping performance. The new BREMBO T-drive Brake Rotors feature two methods of attaching the 320mm floating disc to the carrier. There are five conventional floating rotor spools that maintain the rotor’s relationship to the caliper and five new-design T-drive fasteners. This combed attachment technique allows the rotor to absorb more energy so more braking force is available to a GSX-R1000R rider than ever before. 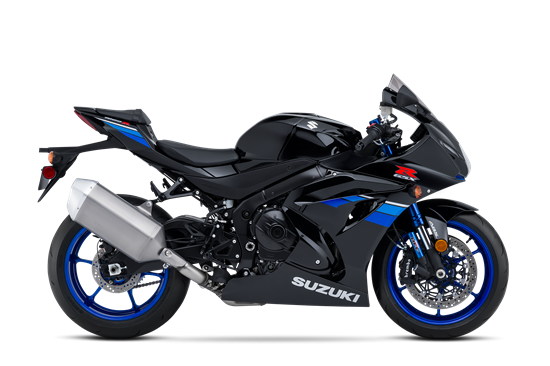 The GSX-R1000R’s new cassette-style, six-speed transmission uses ratios carefully selected for optimal acceleration and top speed. Like the Suzuki GSX-RR MotoGP bike, this transmission can be removed as a complete assembly from the side of the engine and features vertically staggered shafts to reduce overall engine length.